This blog is about allowing request ASP.NET Web Service (ASMX) from cross-origin. In this blog, we are going to create a “Hello World” ASP.Net Web Service (ASMX) with parameters, and allow a request from cross-origin. Now, here we implement ASP.Net Web Service from Visual Studio 2017. 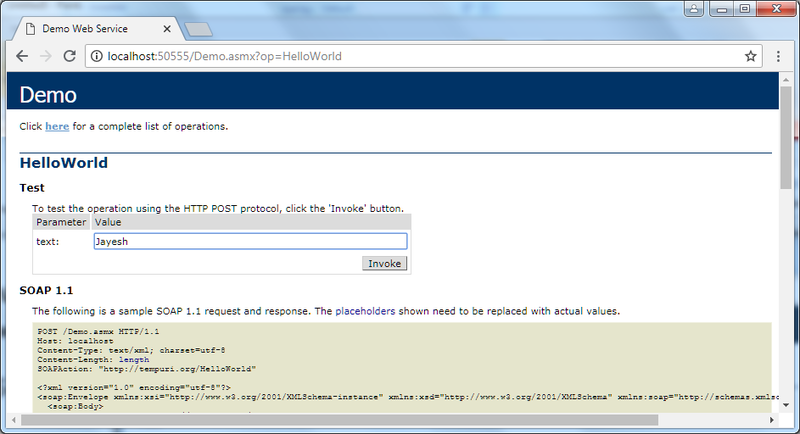 We have created an empty ASP.Net Web Application solution and added “demo.asmx” in solution. We will invoke this web service using HTTP verb. So, we defined “ScriptMethodAttribute” for setting response format JSON. We have learned about passing data to ASP.NET Web Service (ASMX) from Cross-Origin.